Scroll through your file list, open the files you want to explore, and move quickly from file to file. The easiest way to see all your files is to go to the ‘Files’ view by clicking on the ‘Files’ button in the left panel. Here, your documents are listed in a structured manner, based on their folder structure when you uploaded them. 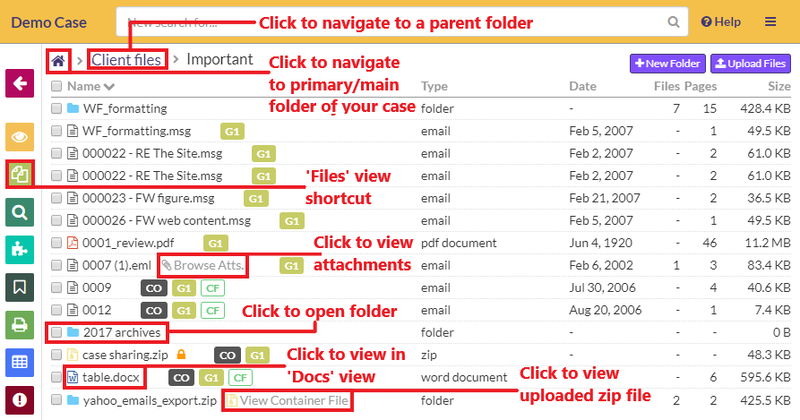 Note: If you are looking at files inside a folder, GoldFynch will display the parent folders in the top-left corner of your screen, all the way to the primary/root folder. You can click on any of the parent folders to quickly navigate to them. Files that contain additional files (e.g. ZIP, PST and MBOX files, emails with attachments, etc.) are known as ‘parent,’ or ‘container’ files, and the files that they contain or that are attached to them are called ‘child’ files. 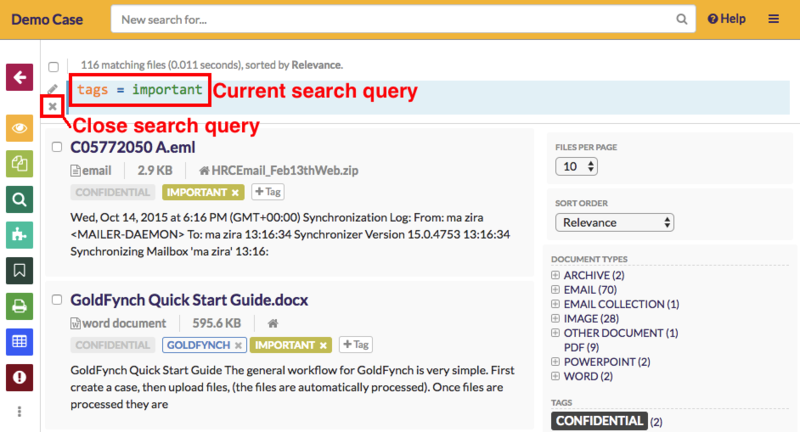 Most types of parent files are automatically processed by Goldfynch, along with the files they contain. Click on the bold see all documents link at the end of the message. 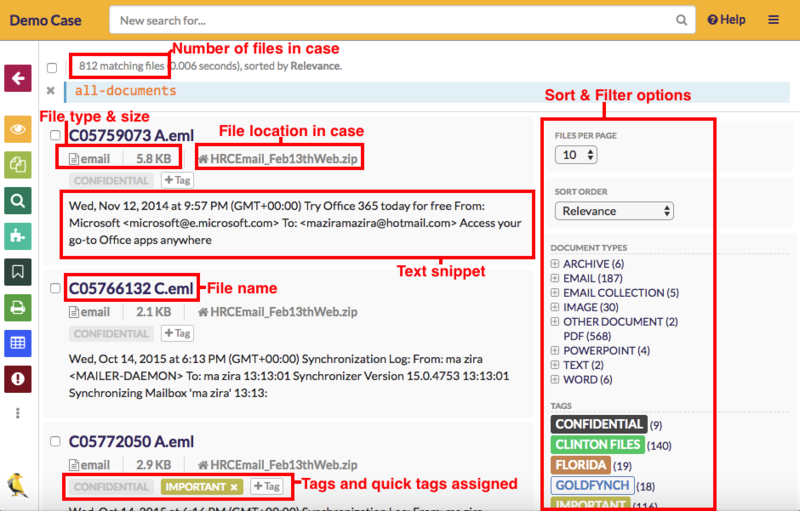 This will display all the files in your case in the ‘Search’ view. Click on the x button to clear the search query. You will now be able to view all the files in your case, as well as additional information–including text snippets–from each file. Click on a file name to open it in the Document Viewer found in the ‘Docs’ view. 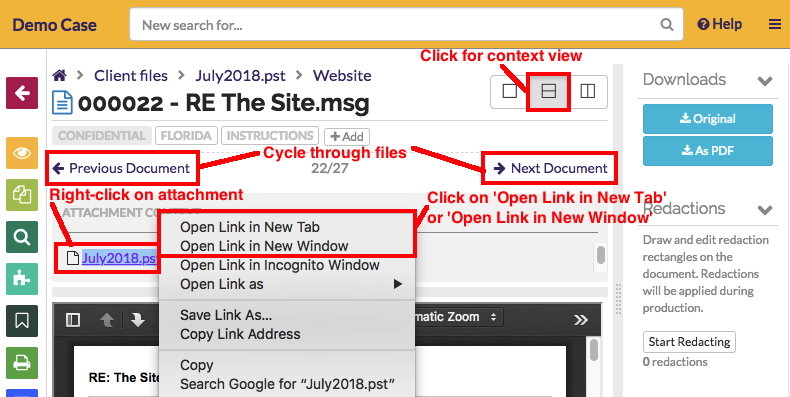 Once you open a file in the ‘Docs’ view you can quickly cycle through documents in the same folder or the current set of search results using the Previous Document and Next Document buttons. You can also see and open the file’s attachments, or other files in its file family. To do so, click on the Context view button, then click on files listed in the ‘Context view’ panel to open them.